We argue that the traditional question ‘fixed vs. flexible exchange rates?’ is not well-defined, because ‘flexible exchange rates’ does not explicitly specify any particular monetary policy. 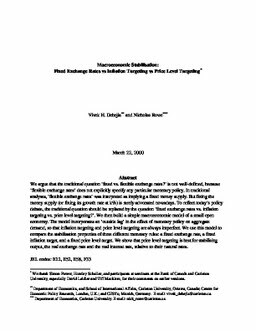 In traditional analyses, ‘flexible exchange rates’ was interpreted as implying a fixed money supply. But fixing the money supply (or fixing its growth rate at k%) is rarely advocated nowadays. To reflect today’s policy debate, the traditional question should be replaced by the question ‘fixed exchange rates vs. inflation targeting vs. price level targeting?’. We then build a simple macroeconomic model of a small open economy. The model incorporates an ‘outside lag’ in the effect of monetary policy on aggregate demand, so that inflation targeting and price level targeting are always imperfect. We use this model to compare the stabilisation properties of three different monetary rules: a fixed exchange rate, a fixed inflation target, and a fixed price level target. We show that price level targeting is best for stabilising output, the real exchange rate and the real interest rate, relative to their natural rates. Dehejia, V, & Rowe, N. (2000). Macroeconomic Stabilisation: Fixed Exchange Rates vs. Inflation Targeting vs. Price Level Targeting (No. CEP 99-15). Carleton Economic Papers (CEP). Department of Economics.